Mr. LEMON joined the line dance with his circle of friends: Ms. CLEMENTINE, Chocolate, Coconut, Ginger and Almonds. 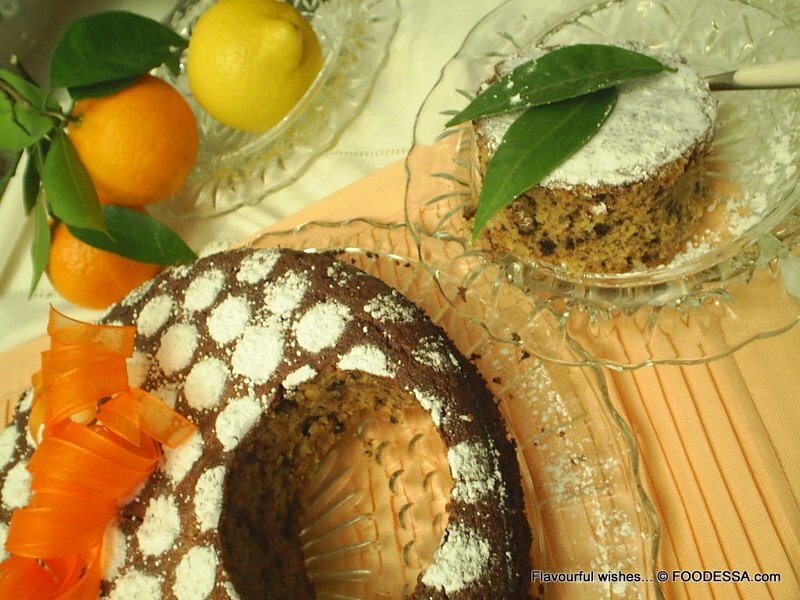 This aromatic, gluten-free cake, turned out to be an incredibly delicious success.
. Use a spring form cake pan to make a 9 inch (22-23cm) torte.
. COOK CITRUS (a day ahead is best): After having carefully washed, scrubbed and rinsed the fruits...place them into a medium saucepan and cover with cold water. Bring the water to a boil. After which, the heat has to be lowered to have them slowly simmer (low-medium setting) for 60 minutes. Make sure to put the lid onto the pot for the whole cooking duration. When the time is up, turn off the heat and keep the lid on for another 30 minutes. Afterwards, strain the cooked fruits and let them cool completely for about 2 hours. 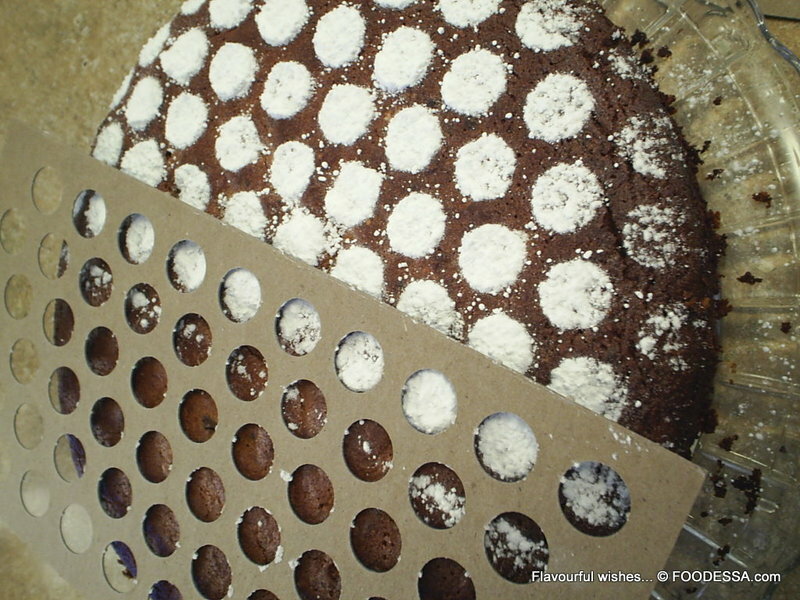 Set aside temporarily if making the cake the same day or refrigerate if making the cake the next day.
. NEXT STEP (much later): Prepare the baking pan...Lightly grease the spring form pan and line the bottom part with a cut-out circle from parchment paper. Set aside onto a (non-insulated) baking cookie sheet. Pre-heat the oven to 375F/190C/Gas 5. Position the rack in the center of the oven.
. DRY mixture: If almonds were not pre-ground...do so in a powerful blender or food processor along with the ginger, chocolate, sugar and coconut. Add also the baking powder and salt towards the end. 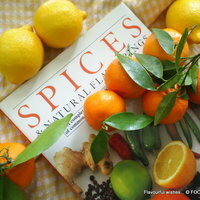 Remove these ingredients into a large bowl and set aside.
. 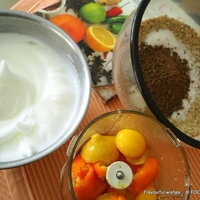 WET mixture: In the same blender or food processor, place the cooked citrus and their peels (making sure any seeds are extracted) along with the egg yolks and the vanilla extract. Process until smooth. Set aside. 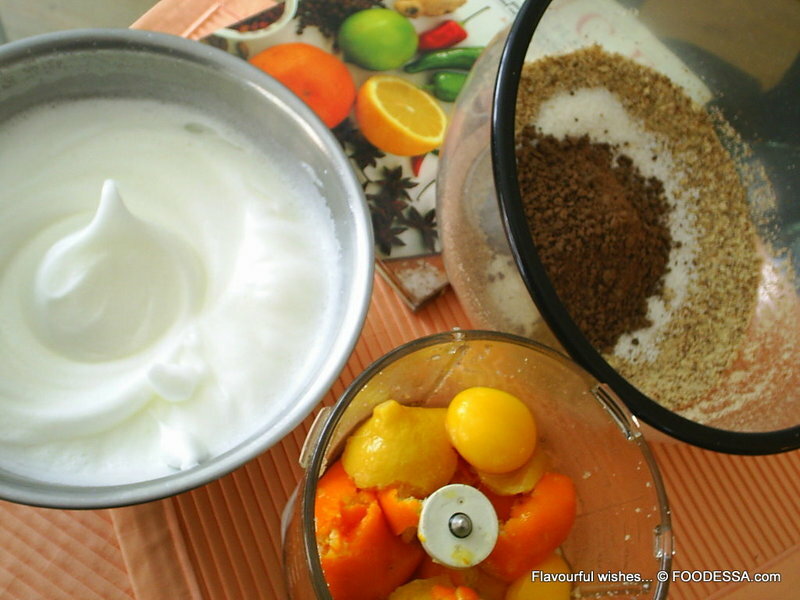 MEANWHILE...in a separate, medium bowl...whip the egg whites until stiff peaks appear.
. BATTER and the whipped EGG WHITES: Incorporate the wet mix into the dry mix and hand whisk until batter is combined. With a spatula, gently fold and blend the whipped egg whites into the batter until well combined. Do not over-mix. Pour the batter into the prepared spring form pan.
. BAKE: For about 50 minutes if baking in a dark pan or 55 min. in a lighter pan. Close the oven and leave for another 10 minutes undisturbed. Note: At first, cracks may appear on the surface which will eventually sink back down without initial cracks. Remove the cake pan from the oven. Place on wire rack to completely cool (at least 3 hours). Before unclasping the cake pan, run a knife around the perimeter. Place a plate on the surface and flip it over. Now, unclasp the cake pan. Remove the bottom part with its paper liner. Place your chosen serving dish and flip it over once more to reveal the final result.
. DECORATION (optional): Sift and spread the confectionary sugar over the cake with an optional decorative stencil. If your wondering where I got this template...it came from a 'BINGO' game set with cardboard chips snapped out of it.
. 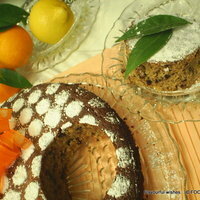 SERVE and STORE: If you can imagine, this cake gets even better as every day passes. The intense flavours have enough time to blend with each other in order to give you a smooth morsel of this delicious torte every time. It keeps well at room temperature for 2-3 days. Refrigerate for up to 1 week, take out and serve at room temperature. 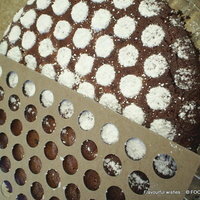 Or, better yet, warm up the cake on very low heat in the oven as your home will get that wonderful aroma once again. 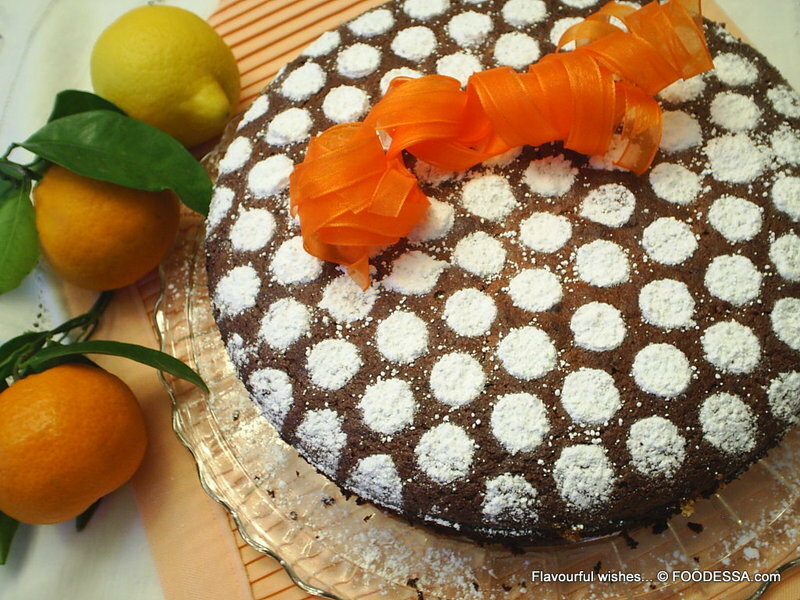 This torte also freezes very well for up to 1 month. Package it in a parchment paper and then slip into an airtight freezer plastic bag. Serve and enjoy. Love these flavors with chocolate and the presentation is very pretty. Hello Supriya...I'm thrilled at your enthusiasm. I would want to suggest that you NOT try to make this with the peel of a regular orange. 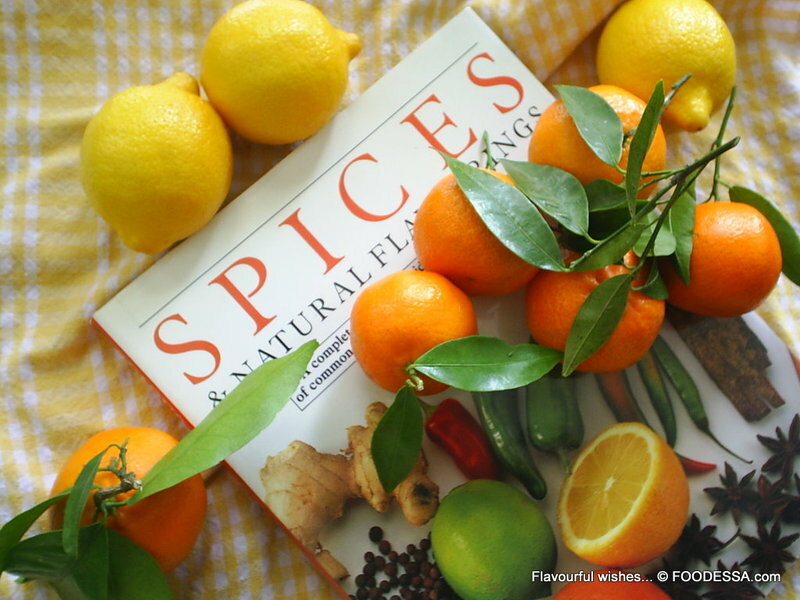 The thickness of the 'pith' of the orange would lend itself too bitter for such a recipe. If it's possible...try too find any thin-skinned smaller orange variety. If and when you make this cake...I'd love to hear how it turns out. Looks like a must try recipe! Clementines are difficult to find in India. I would try my luck with orange and see how this tuns out. Thanks a ton for posting this recipe. In response to your question...I could only imagine the 'egg replacer' should be fine...isn't that probably why they created this product? I personally have never worked with this and would love to hear from you if you ever get around to experimenting with it. Yes, I also agree...the applesauce would probably weigh it down. This is one of the lovliest creations yet! Beautiful job on this number, Foodessa, just beautiful. 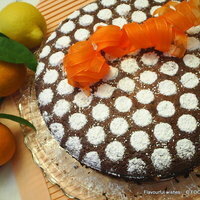 Beautiful cake ....n I love Clementines.... Must def try this one! !